Above: He seems to be much more impressed with his driving than she is. It’s April 12th, 2013 and it’s spring in Wetaskiwin. The huge piles of snow have pretty much vanished. It’s April 13th, and although still spring in Wetaskiwin no one told the weatherman. Mother Nature opened up the skies and dropped a fresh 20 cm. blanket of heavy, wet snow on the City and region. 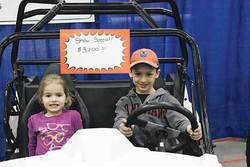 Regardless, the telltale signs of spring remained evident; the robins and geese have returned, sprigs of green grass are evolving and the fifth annual Wetaskiwin Chamber of Commerce Trade Show has returned. The Trade Show opened its doors to the public on April 12th and 13th. Although the 2012 event was a huge success Executive Director Alan Greene restructured the 2013 Trade Show to make it more, as he describes, “visitor friendly and allow for more booths.” The plan with the City taking the ice out earlier this year was to “move our main Trade Show Booths into Arena 1. We will then be having the Agriculture Hall in the Drill Hall, which with its large bay doors will allow large equipment to be brought in doors.” However, plans change and the Drill Hall housed the Trade Show booths and Hi Line Equipment filled Arena I with farm and acreage equipment. The two venues were connected by an indoor hallway and with no hockey happening in the arenas, there was easy access to parking. More local businesses were at the Trade Show and it was a great opportunity to meet with them, some for the first time, and learn more about their products and services. As residents slowly made their way through the exhibits they could be seen sharing information with the exhibitors and visiting with people they don’t regularly see. It is evident the Trade Show has also evolved into a social event. Comments from both vendors and attendees clearly rated the Trade Show as very professionally planned and hosted.